Whether he’s squeezing out the deepest blues or playing the funkiest soul grooves, legendary blues and soul giant Tommy Castro knows how to ignite a crowd. Over the course of his still-unfolding career, the guitarist, vocalist and songwriter has released 15 albums ranging from horn-fueled soul and R&B to piping hot blues to fiery rock ‘n’ roll. He’s performed all over the world, earning countless fans with his legendary, sweat-drenched, exhilarating live shows. Castro’s band, The Painkillers—bassist Randy McDonald, drummer Bowen Brown and keyboardist Michael Emerson—have now been playing together over four years. After hundreds of live shows, they have coalesced into one of the telepathically tightest units Castro has ever assembled, making them one of the most in-demand live roots music acts performing today. Billboard says the band plays “irresistible contemporary blues-rock” with “street-level grit and soul.” With the group seemingly hitting new heights with every performance, Castro knew the time was right to answer his fans’ demands for a live album. Killin’ It–Live captures the band at the peak of their creative and improvisational powers, and features one unforgettable, unpredictable performance after another. “This is the best band we’ve ever had,” says Castro. We really got something going on beyond just being good musicians. Every song we play live now has that right feel—all the dynamics. It allows us to jam out more on stage. 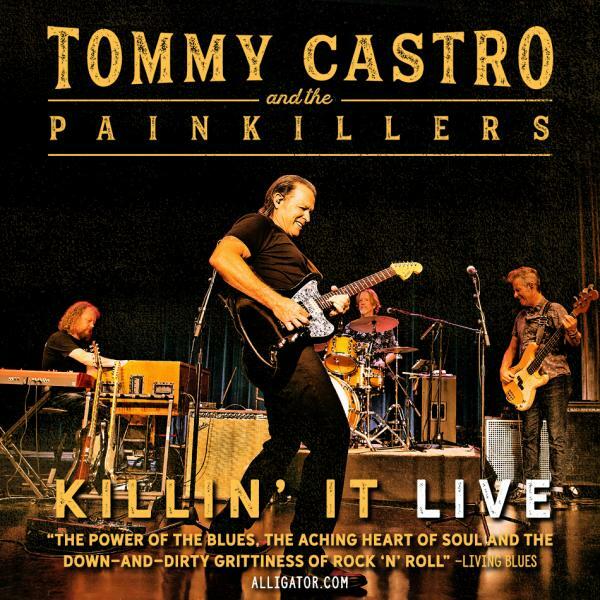 Killin’ It–Live is what you hear when you see us live.” Featuring songs from throughout Castro’s career, Killin’ It-Live was produced by Castro and engineer/songwriter Ron Alan Cohen and recorded at venues in Texas, New York, Michigan and California during 2018. The album includes eight Castro originals spanning his entire career and two Castro-ized covers, each showing a slightly different side of his multifaceted musical personality. From fan favorites She Wanted To Give It To Me and Make It Back To Memphis to newer classics like Lose Lose and Two Hearts to Taj Mahal’s arrangement of Sleepy John Estes’ Leaving Trunk (a song Castro has never recorded before but has been playing live for years), Killin’ It–Live is a nonstop, spirited mix of blues, rock and soul, with rollicking, hypnotic grooves fueled by Castro’s animated, fervent vocals. Tickets to see Tommy Castro & The Painkillers at Bridge Street Live are $25 for General Admission and $35 for VIP (plus fees).